Outside my Window... fall is on back-order. It's probably going to be in the mid-nineties all week. I am thinking... I hope my daughter's cough is vanishing today. From the learning rooms... we've been making my 2nd grader's schoolwork a priority and I'm not getting all the preschool activities done. I am thankful for... coffee. From the kitchen... my husband bought some Shropshire cheese and it was lovely with grapes last night. I am wearing... brown shorts, flowered shirt. I am reading... Brian McLaren's book "Finding Our Way Again"
Around the house... there's a lot to do. Lots of clutter, lots of dust. One of my favorite things... is Market Spice Tea from Pike Place Market in Seattle. A Few Plans For The Rest Of The Week... taking two kids to swimming, talking with a new friend there. Daybook Monday is hosted here. ...Jennifer! I'll be mailing the book this week. Leave a comment here to enter a contest for a parenting book. The French Women Don't Get Fat website has a recipe for Budwig Cream, a healthy delicious breakfast food. I wanted a little more protein and a little less fat in my breakfast, so I came up with this adaptation. We call it "crunchy creamy yogurt", and it is popular with the children as well as the adults in our household. Combine those four ingredients, stirring well after each addition. Grind 12 hazelnuts and 1/4 cup grapenuts cereal in a coffee grinder, then add to the yogurt mixture. Serve immediately. Serves 2. Each serving has 283 calories and 10 grams of protein. To make a complete breakfast, I slice an apple (sharing it with my husband) and give us each 10 grapes, making a 353 calorie breakfast. I've used pumpkin seeds instead of hazelnuts--I'm sure you could substitute your favorite nuts. And other cereals would work too. Works for me Wednesday is hosted by Rocks in My Dryer. and thoughts on a culture war at Donald Miller's blog. Now I will leave the blogosphere and re-enter the world of dishes and laundry. Last week I attended my Grandma's graveside memorial service. It was a perfect autumn day in the Pacific Northwest with glimpses of blue sky between tall evergreens. Grandma was buried in a little country cemetery near the home she had shared with her husband in the 1930s. Her husband's family were pioneers in an area that remains rather rural: a few homes, a school, a tavern, a church (without a pastor at the moment), and a Bible camp make up the community. As we left the service, my best friend said to me, "Your family is here because of you." We were walking towards the Bible camp where a luncheon was being held for Grandma's family members and friends. I had to think awhile about what my friend meant. When I was thirteen, I was asked to volunteer in the kitchen at Bible camp. The hours were long but I found it fun, and I returned the next summer for several weeks, and by the time I was eighteen I spent the entire summer at camp, volunteering in various capacities depending on the week's guests. The rewards of working at Bible camp were obvious: fun times and good friends. (In fact, I met both my best friend and my husband at camp.) I had to move on to paid employment when I was nineteen, but my dad retired that year and suddenly he was interested in volunteering at camp. When my mom died, my dad was lonely and went to camp every chance he could. A new manager came to camp and my dad adopted the manager's family when my husband and I moved far away. Last spring, that manager and his family helped my dad with his final move to an assisted living center. When my dad died, the camp manager spoke at the graveside service, and offered the camp as a location for the memorial service. My dad's family was impressed with the service and my two organized aunts got the camp manager's phone number, saving it for a future need. That need was last week's service. The same camp manager spoke at Grandma's memorial service, sharing the good news of Jesus with my family--many of whom have never shown much interest in spiritual things. Without the contact with the camp manager, who would my family have called on for the service? Where would we have gathered for lunch (none of us live in the area)? When I was thirteen, I didn't think I had much to offer. I didn't think I had any talents, and when I worked at camp I was just the kitchen "go-fer", not even a cook--yet the choice I made to serve that week eventually resulted in fifty people sitting in a sunny cemetery hearing about Jesus. Lord, remind me to keep serving You. This week I'm giving away a copy of Through Mark's Eyes. The back cover says "Through Mark's Eyes invites you into the Jesus story--to walk the dusty roads, to row the boats on the Sea of Galilee, to witness healings, to stand in the Temple, and to weep at the cross. This dramatic, colorful, moving version of the Gospel of Mark is not a new translation; instead, Puck Purnell augments the New Revised Standard Version of Mark with vivid language and descriptions to reimagine the Gospel story and breathe fresh life into it." To enter the contest you need a blog and a US mailing address. and mention the contest (with a link to this post) on your blog before Saturday at 5:00 p.m. Pacific time. I'll announce a winner on Sunday or Monday and I will e-mail the winner to get a mailing address (which of course I will share with no one). ...Cheryl! I'll mail the book out this week. Thanks for entering! Readers, Cheryl's blog has many other give-a-ways listed. Outside my Window... the palm tree is almost motionless. So very little wind today. I am thinking... how very nice a nap will be this afternoon. From the learning rooms... school will be late today due to all the errands we had to run this morning. I love the flexibility of homeschool! I am thankful for... a good friend who met me at the airport last week, gave me a place to stay, drove the 3 hours to my Grandma's funeral, and attended with me. From the kitchen... I found pizza dough on sale today and bought all we need for a pizza dinner for less than $14. Pepperoni for the kids, roasted eggplant and goat cheese for us. I am wearing... green shirt, black yoga pants. I am reading... an old issue of Quiet Spaces titled "The Feast"
I am hoping... for energy and peace. I am creating... absolutely nothing. I am hearing... my four year old singing as she runs to wash her hands. Around the house... there's a bit of catching up to do as I had an unplanned trip to Washington last week. One of my favorite things... is seeing my husband's face when I return from a solo trip. A Few Plans For The Rest Of The Week... taking one day at a time. 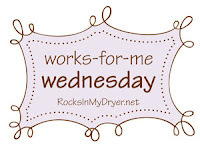 Rocks in My Dryer hosts Works-for-me Wednesday, a chance for bloggers to share helpful hints on many subjects. My bathtub is my favorite place to take a mini-vacation. Today I'm sharing a simple way to keep the bathtub clean. As your bathtime draws to a close, grab your bath puff and put a little shampoo on it (I use a natural shampoo with tea tree oil and lavender). Quickly wipe off the edges and the sides of the tub. After you exit the tub, add a little water to your puff, a tiny bit of shampoo, and wipe the bottom of the tub. This works well in my jetted bathtub (which does not have a shower attached). Check out this week's book give-a-way. 1. Leave me a comment with a link to your blog. That's all. Do those two things before Sunday at 10 a.m. and I will announce a winner late Sunday or early Monday. To the winners of the last two contests, I was slow to mail out your books but they are indeed on the way. Outside my Window... it's cool enough to go for a walk in the middle of the day now. Highs in the 90s are so much more comfortable than highs in the 100s. I am thinking...I haven't announced a winner for the free book giveaway! Perhaps in an hour or two. From the learning rooms...my 2nd grader started swimming lessons today--her first ever. In History this week we'll be learning about the American Flag. We'll start Science this week (need to finish those lesson plans...). I am thankful for...home and safety. From the kitchen...I thawed out hamburger, and I purchased red potatoes and mushrooms. I trust my husband to make something lovely out of them for dinner tonight. If only I had bought green beans we could have shepherd's pie. I am wearing...a turquoise shirt and brown shorts. I am reading...The Unknown Ajax, Georgette Heyer. A little romance, a lot of history, and a bit of adventure in the Jane Austen era. Written by a British lady in the 1930s or 40s, I believe. I am hoping...we have a chance to go to the library today. How the Irish Saved Civilization is waiting for me there. I am creating...ideas for my next Bible study, and handouts for the current one. I am hearing...a singing girl in the bathtub. Around the house...so much to do. Vacuum, scrub, fold, nap. One of my favorite things...is a homemade hazelnut latte. A Few Plans For The Rest Of The Week...teaching Bible study, exercising, sorting outgrown clothing, NOT spending money. A recent comment asked me "what is an HP gal?" I'm a member of the Hannah's Prayer forums at hannah.org, a ministry for women who have experienced infertility, pregnancy loss, SIDS, and adoption loss. HP is "Hannah's Prayer." This was certainly confusing to me when the Homeschool Forum I belong to was discussing Harry Potter, and referring to him by those same initials! In the book giveaway, if you mention the person who referred you, I will give them another entry in the contest. Rocks in My Dryer hosts "Works-for-Me Wednesday". This week, I'm joining in with a very simple thought: if your kids eat two meals a day outside on the patio, your dining room won't need to be vacuumed nearly as often. You can also offer foods you would never offer in a carpeted dining room--popsicles and red jello, to name two. It's a great place for the little ones to practice using a non-sippy cup as well. When the weather keeps us from using outdoor dining facilities, I resort to only offering popsicles to children who are in the bathtub. Our oldest child is an 8 year old named Robin. Robin was due September 9, 2000, but the Lord took Robin to heaven sometime before February 4, 2000. I remember the joy and excitement of that first pregnancy--dancing around the kitchen with my husband when I told him we were pregnant (with LeeAnn Rimes in the cd player, singing "You Light Up My Life"). I remember the naive confidence that because I saw two lines on a pregnancy test, I would soon hold a baby in my arms. I always pictured this baby as a girl. I still do... I always imagine Robin dressed in a red dress, skipping through red and yellow tulips in heaven. Losing Robin--and another baby, Hope, a few months later--sent me into a dark tunnel that Faith's birth brought me out of in late 2001. Life has gone on to a new chapter, and my grief for Robin and Hope is no longer a huge wound to be bandaged daily...but I will always have a scar. Today I was thinking about Robin as I drove the kids home from church, and listening to a CD I hadn't heard for awhile. "Come Unto Me" began to play, and I remembered listening to that song and being comforted by it eight years ago...and then I heard Faith singing along. "I love this song, Mama," she said. And I was comforted. Outside my Window... it is a little smoggy, as I found out when I went walking at 6:10. From the learning rooms... second week of school, beginning US History. I am thankful for... the lessening of my back pain. From the kitchen... a rice and sausage dish tonight, using my husband's amazing garlic soup as the liquid for the rice. I am reading... Stiff Upper Lip, Jeeves, by Wodehouse. I am hoping... to get back to my walking routine now that my back is improving. I am creating... a short speech to introduce my new Bible study tomorrow. I am hearing... Joy playing with her dolls. Her daddy voice is funny. Around the house... trying to catch up from last week's back-pain-enforced chore vacation. One of my favorite things... is sunrise with a cup of coffee. The Simple Woman's Daybook is hosted here. Check out the book I'm giving away this week. This week I am giving away a practically new copy of Real Simple: Cleaning. This spiral bound book is full of helpful hints about cleaning everything in your home. I cannot give you a glowing personal review, but I can tell you that simply placing this book on your bookshelf will not give you a spotless home. If you would like a chance to win this book, you need to do two things before Saturday, September 13 at 5 p.m.
Leave me a comment here with a link to your blog. Place a link to this post on your blog. I will announce the winner next Sunday, and e-mail the winner to get a mailing address. I'll mail the book out by Wednesday. I'm listing this under the "Friday Funny" tag because the whole idea of microwaving a cake-like substance is funny to me. My kids thought it was hilarious to have cake in a mug. Faith asked if she could please eat it with a fork--she was apparently concerned that we would drink the cake. The texture is a little odd--cakes are not meant to be baked in a microwave. But Faith was sad that she didn't get to attend a church activity this week, and this recipe was a great way to cheer her up. I suppose I have taught her a valuable life lesson now: when life is disappointing, chocolate is the cure. Mix in a large coffee mug. Mix in a small bowl, then pour into dry ingredients and mix well. Microwave for 3 minutes. The cake raised over the top of the mug, but did not overflow in the microwave. Allow to cool a little, and tip it out onto a plate if desired. Serves 1 or 2, depending on age and degree of chocolate-neediness. Today was our first day of second grade for Faith, and the first day of preschool for Rose and Joy. We're using Little Hands to Heaven for preschool, and it uses several Bible story books, introducing the letters of the alphabet through the Bible stories. Today we learned about A-A-Adam. We also listened to a song from The Singing Bible. I encouraged the girls to move around during the music. Rose retreated to the couch to hold her baby (she's tired today due to a nosebleed interrupting her sleep), but Joy and Faith danced and skipped around the livingroom. Joy is 2 1/2 and she kept saying "This is a-fun! This is a-fun!" We're using A Beka for Faith's second grade. I've tried less traditional programs, but A Beka works best for her. Today we did math, phonics, and writing. Phonics will be every-other-day, alternating with language. Next week we'll add history, spelling, and reading, and the following week we'll start science. Today we were done with preschool and 2nd grade lessons in an hour and a half. Faith is sometimes stressed by the thought of trying new activities. This is the year she'll be learning cursive, and I was a little stressed thinking about her being stressed by that. So today I gave her a worksheet to trace. It simply has her name in cursive on one side and the cursive alphabet on the other side, enclosed in a sheet protector for easy tracing (and erasing) with dry erase pens. I told her the alphabet was just for looking at, but she needed to trace her name each day. Amazingly, she did this with no complaints or worries. And after school was done she asked for the "special pens" again so that she could do more tracing. She wanted to work on more cursive letters! ...Outside my Window...it's 74 degrees, a little breeze, blue sky. I am thinking...how wonderful it is to turn the calendar page to September. The desert weather is cooling (yesterday's high was only 91), and Bible study will be resuming at church. I am thankful for...the beginning of September. Yes, I am repeating myself. It is a great relief to have the excruciating heat of summer on its way out. From the kitchen...scrambled eggs on olive garlic toast, with a Welsh rarebit sauce. I am wearing...my pajamas. Don't judge me. It's Labor Day. I am hearing...my two littlest taking a very long time washing their hands. Hmmm. Around the house...I really need to tackle my closet. One of my favorite things...is tea. A Few Plans For The Rest Of The Week... school begins tomorrow!